Part Two of our Holiday Gift Guide is here! Let’s be real: shopping for babies can be hard. They grow so quickly. It’s hard to know what items will last, what things will interest them, and what toys you’ll resent having bought when you’ve heard that dang doll sing “LET IT GOOO!” on repeat for the 87th time. So, we’ve done all the leg work for you. 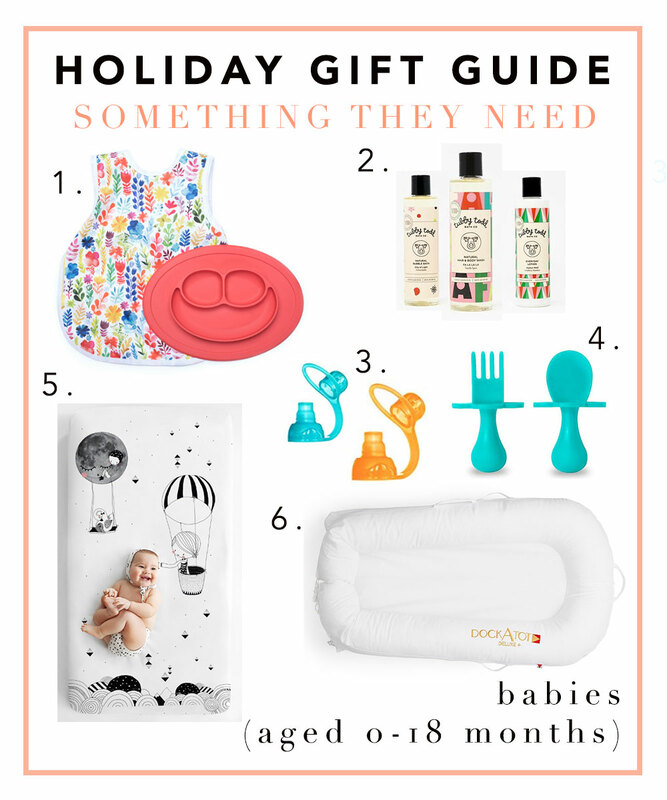 Here are our favorite baby gifts in the “Want, Need, Wear, Read” categories. And, in case you missed it, CLICK HERE for the Preschooler Gift Guide (Ages 2-6). 1.) Pidoko Wooden Push and Pull Activity Cart - Colorful, versatile, and fun — we love this cart! 2.) Skip Hop Activity Gym - Let’s be real, the majority of these things are ugly. This one is a little easier on the eyes and easily folds to be stashed away on those days when you’re just sick of looking at baby stuff, ya know? 3.) Battat Wooden Activity Cube - Quite possibly the most versatile toy in our house, from ages sitting and beyond. Plus, it’s sturdy enough for them to pull up on when they’re able. 4.) Plush Llama - Because who doesn’t want a stuffed llama? 5.) Boon Building Bath Pipes - My kids love these and they make bath time more fun — and quieter, so mama can enjoy a glass of wine! 1.) EzPz Coral Placemat + Bapron (or, really anything from EzPz) - Say it with me now: life. saver. The mat sticks to your table or high chair so that baby can’t spill or fling their plate or bowl, and their bapron provides more coverage for messy meals. 2.) Tubby Todd Noel Set - We love anything by Tubby Todd! It’s a small, family-owned company that’s designed especially for little skin. It completely cleared up my son’s eczema as a baby, and since then, we’re believers! I love this holiday set - and really, anything they make. 3.) Choo-Me Pouch Toppers - Don’t you love it when your child squeezes out an entire pouch into their hands in one quick grab? Enter pouch toppers. They keep pouches from pouring out and making a mess. 4.) Grabease Utensil Set - Another family-run company that we love! Grabease helps little ones learn to use utensils with an easy-to-grab design, as well as a choke barrier, so that they can’t swallow them. Perfect for little hands learning to eat! 5.) Rookie Humans Crib Sheet - These whimsical crib sheets are super soft and also adorable. 6.) DockATot - A must-have for babies in our house. The design keeps baby snug and stationary. 1.) Sheep Sweater - Because it’s baaa-dorable. See what I did there? 2.) Goumi Alls - Goumi is my favorite PJ brand. Super soft, there’s a booty flap, and the feet fold over so that they can be both covered and uncovered. 3.) Goumi Jamms - Same as above, but the “sack” option on the Jamms make middle-of-the-night diaper changes way easier. 4.) The Ollie Swaddle - GAME. CHANGER. I know what you’re thinking - you spent how much on a swaddle?! But believe me when I say: my child never breaks out of it and sleeps much more soundly. I ordered it in the middle of a (sleepless) night in a fit of rage, and have never regretted it since. 5.) Leather Crib Shoes - Because they’re adorable and go with anything. 6.) Bow Slippers - Exactly the same as above. 7.) Pom Pom Beret - I NEED THIS FOR MY BABY. 1.) I’ve Loved You Since Forever - Cue the tears. As foster and adoptive families, we love this message and this book! 2.) Boynton’s Greatest Hits - These cute little board books are a family favorite. They’re short enough to keep my kids’ attention, and engaging enough that they remember the words. 3.) Giraffes Can’t Dance - Oh they can’t, huh? 4.) JellyCat Soft Tails Books - Perfect for smaller babies, these JellyCat books come in several different options and are great for little hands to explore.